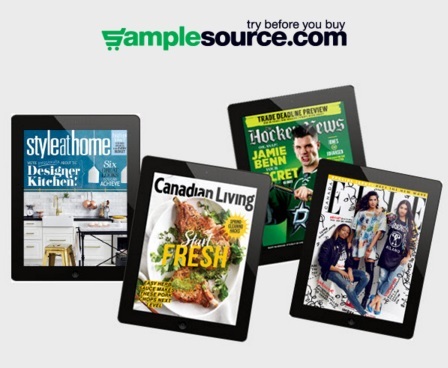 If you missed out on Samplesource Free Sample Packs a few weeks ago, Samplesource sent out an email for a Free special offer to select members today for a Free magazine subscription! These are available in limited numbers so be sure to log into your account to see if you can get one soon! Look for the EMAIL from Samplesource and click on the link in the email for your account specific offer. This is for select members only (probably for those that did not select a magazine when ordering their sampler pack). These are available for various magazines (Style at Home, Hockey News, ELLE Canada and Canadian Living) and include a Free 6 month trial subscription! Limit one package, per address and/or email and/or IP. Duplicate orders will be removed. Click here to get your Free magazine from Samplesource.